THBusiness theme options panel will help you to add custom logo, favicon, slider, footer description etc. So you don’t have to edit the code to achieve these specific tasks. The thbusiness is one of the finest business theme I have seen. Good wishes for your work. There are many themes for business . But few of them are the best . After seeing the features of the responsive theme shared here for business , I can just say this is one of the best themes . On the other hand you have tried for presenting the fully features on the theme . This is why i wish your effort will be fruitful . Thank you author for sharing such nice and very effective theme here. I just wanna thank you “guys and girls” for a very nice free and easy to customize “WP-Business-Style” theme. It’s very easy to setup and include the basics for a modern WP Business Website. This theme is quite awesome. Why didnt you listed it on wordpress repo? How can I change the slider text font? Quick question regarding use of MORE tags. We’d like to use them in longer staff bios on our About –> Team page. It appears that this theme doesn’t support use of the MORE tag on any pages but the home page? How to reduce the height of slider on home page. Slider height depends on the image height. So upload a low height image. But image width should be at least 1368px to display properly in most devices. I’d like to add columns to a full-width-page. However, the plugins I loaded do not appear to work with your theme. Is there another way to add columns to a full-width-page? there seem to be some bugs with the Services Widget. The pages are listed in the order I choose, and the FA icons don’t match up. Any suggestions on how to fix this? This happens because the font awesome library that is included in the theme is an older version. So some icons does not shows up. I will include the latest FA library in the next theme update. Hello, thanks for this very nice theme ! I just have a problem: how can I decrease the left margin so that the menu fits on one line only? I can’t find a solution. Thanks ! Thanks for the beautiful free theme. I always advice to my friends who work with WordPress, don’t use a nulled theme, there are too many beautiful free themes are available, that’s just an example of cool free theme. 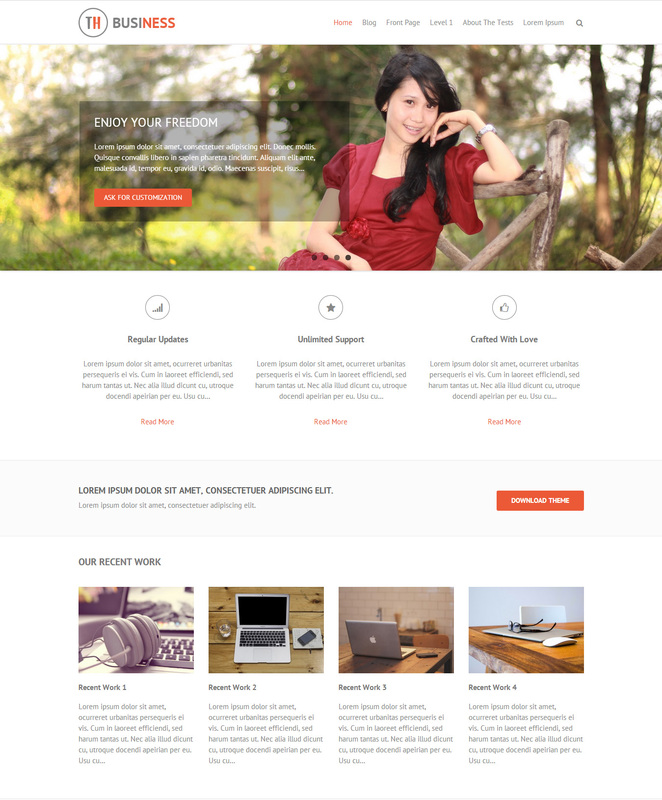 Really Nice WordPress business theme. i just show homepage 2 column . i can’t show Testimonial Widget, Our Clients Widget, Call To Action Widget. Please help me ! Hi hoan, Could you please refer the documentation? how to remove date stamps from posts? I really like the theme. I want to be able to add kind of like a “bar” in the header area above my logo with contact info and maybe add the social media, but I am not sure where should I add it on the code or how. If is not too much to ask can I get some guidance on this? I love the THBusiness theme. Great job, but do you have a guild for setting up the widgets? When I place a widget there seems to be other ones there as well. I will joyfully recommend this theme. Thanks Dennis you love it. I haven’t figured out such an issue earlier. But I will look again. how we add custom css in this site. i find it but i dont get the custom css option.